We get it. The front pocket shape isn't for everyone. So we've developed the R Series - the Anti-Rogue, if you will. A traditional rectangular wallet. Classic and reliable, made of top-grain leather. Offered in Charcoal Black, this wallet combines rectangular bifold tradition with Rogue innovation, providing a slot for micro key ring cards. RFID shielding technology is stitched directly into the leather, protecting you from digital theft. 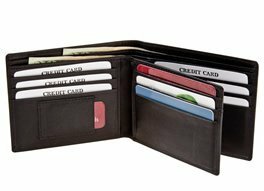 The wallet billfold opens at the top and fits both American and international currency just fine. Don't get scammed! A new form of pickpocket has appeared on the scene, and you don't even need to be physically touched to lose your valuables. Crooks now can electronically scan your credit and ATM cards, while they are still in your wallet or purse, without you ever knowing about it. Unless you have a RFID-Blocking wallet, that blocks the signal from leaving your wallet. Dimensions: 4 3/8" X 3 1/2" X 3/8"